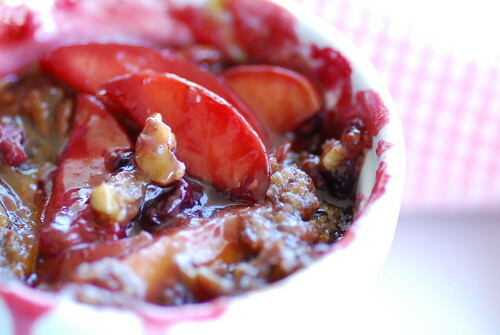 Food Blogga: Nectarine and Raspberry Crumble. It's Not a Cobbler or a Crisp. Nectarine and Raspberry Crumble. It's Not a Cobbler or a Crisp. It's that time of year again when people everywhere find themselves completely confused about crisps, crumbles, and cobblers, not to mention brown bettys, slumps, and grunts. I talked about this last year, and many of you bravely fessed up to your own inability to remember which is which. I think I'm finally starting to remember. How 'bout you? Think you know the difference yet? Let's find out. 1. 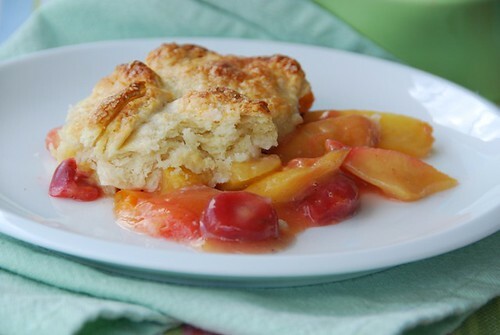 This dessert has a dough-like crust, which can be enclosed or made as a biscuit topping. 2. This dessert is made by mixing fruit with sugar and spices and topping it with a streusel, which is a mixture of butter, sugar, flour, and nuts. 3. This dessert is made by mixing fruit of your choice with sugar and spices then topping it with a crisp mix made of butter and sugar and a binding agent such as flour or oatmeal. OK, hands off the keyboard, folks. Let's see how you did. #1 is a cobbler. #2 is a crumble. #3 is a crisp. If you missed any, don't worry. The best way to learn something is by doing it -- so make all three desserts and eat them! 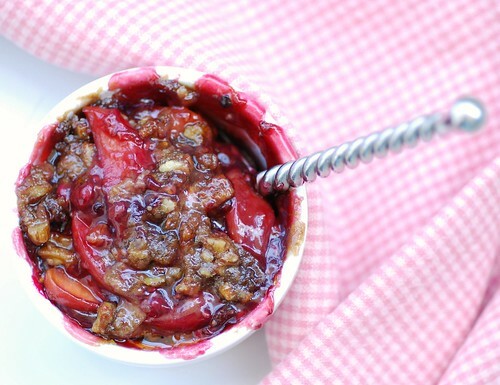 Start with the simplest of all, my Triple Berry Rhubarb Crisp. Finally make this Nectarine and Raspberry Crumble. Nectarines are coming into season right now, and their sweetness and aroma blend beautifully with tart fresh raspberries. The fruit is perfumed with fresh ginger and vanilla extract then coated with an irresistible streusel topping made with brown sugar, pecans, and a medley of spices. It's delicious as is, but I won't discourage you from topping it with a scoop of vanilla ice cream or a dollop of silky creme fraiche. Center a rack in the oven and preheat to 350 degrees F. Coat a 9-inch round pie dish with cooking spray. To make the crumble, place the butter in a bowl. Using your hands, break it into small pieces, then work in the sugar, flour, and pecans. Gently mix it, breaking up any large clumps. Using a rubber spatula stir in the cinnamon, ginger, and nutmeg. Set aside. To make the fruit filling, in a heavy bottomed saucepan over medium-high heat, melt the butter. Add the nectarines and sugars. Cook until slightly tender, stirring occasionally, about 5 minutes. Add the raspberries, ginger, and dissolved cornstarch. Stir until the mixture begins to thicken and bubble up, about 2 minutes. Turn off the heat, and stir in the vanilla extract. Pour the fruit filling into the prepared pie dish, and sprinkle the streusel evenly over the top. Bake for 25-35 minutes, or until the topping is golden and fruit filling is bubbling up around the edges. Allow to cool before serving. It's best served at room temperature or just slightly warm. Great dessert! I love mixed fruit in a cobbler or crisp. OK - I flunked. But, I'm heading straight to the greenmarket to pick out some fruit and top it with something crispy, or crumbly, or whatever! Mmm love nectarines. I think my favourite would be a cobbler because I love the doughy crust! Such tasty ingredients! Yum! One of my favourite desserts! I can't keep the names straight but I love them all! 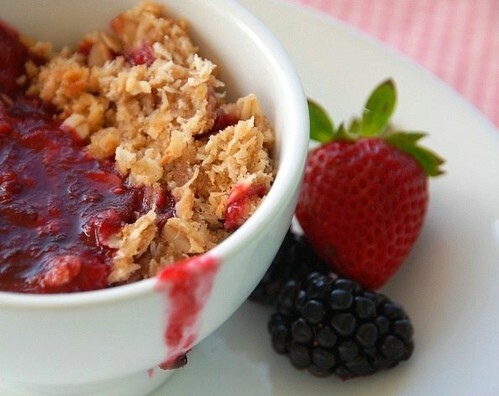 Great looking crumble! That buttermilk biscuit crust is irresistible. That's for sure! I remember reading your post on this to me confusing subejct. Still, I got #2 and 3 wrong. I guess I am hopeless. Maybe that is why I tend to stick to cobblers! I promise, I'll study harder and do better at the next test. I think I'm going to have to practise this. A lot. With my stomach. I'll start with whatever that last one was, mmmm. This is an absolutely beautiful dessert. I adore nectarine season, and you have put it together in one of my favorite forms. Great flavor combo with the nectarines and raspberries! I appreciate the explanation! I can never keep it straight myself. I adore nectarines and am always picking them up right now... I love your recipe for the crumble! My Gosh look that the colors! I can never remember the names :-) but love all of the versions. tw-You still get an "A" for effort. ashley-Oh, I love that puffy, doughy topping too! val-Now that's the kind of decision I'd like to ponder. haleysuzanne-I'm happy to hear it! patsyk-You're so welcome. They sure can be confusing. citygirl-I'm glad you liked it! foodlibrarian-I thought you might enjoy a quiz! Mmmm a lovely and tasty blog!!! Soooo delicious and nice piturces!!! Mari. Amazing blod dessert look so Delicious ! I was good with the first two, and then read the last, and saw oats...and I thought "oh, no, is THAT one a crumble? Now I've gone and confused myself!" And then I cheated and looked at your answers. Truth is, made well, these are all desserts I could eat every day of the week...sometimes twice a day! I love it Susan...everything about this post. Learnt something new today. YAY...made peach & cherry crisps this morning (& they weren't crumbles coz they had no nuts). I love the freshness of crisps & crumbles, & have yet to try a cobbler! The post is singing to me!! foodcreate-I'm glad you liked them. Thanks! deeba-Peach and cherry crisps? Mmmm... save me some. ;) And you've gotta try the cobbler; the doughy texture is amazing. Didn't take the test--I know I'd fail miserably. But I could successfully eat any one of these beautiful desserts, Susan! This is one utterly gorgeous crumble Susan! What a clever post, susan! Whatever they are called I love them all! I love using fruits in crumbles... makes me think of summer! Those fruits are such beautiful colors. My new favorites are white-fleshed nectarines, which are everywhere in the markets now. The flavor is mild and makes a good foil for raspberries or strawberries. Put a bit of something crumbly on top, and it's a little bit of heaven. Thanks for clearing that up - when making mine I was actually thinking whether it was a crumble or a crisp! :) Love the first photo - glossy and delicious! Ahhh, the subtleties of food...crumble or crisp or cobbler! I like them all but again I know the differences, merci! terry-At least you admit it. afos-Summer fruits are my favorite too. lydia-I'm a fan of the yellow fleshed ones myself. joey-Glad to be of assistance! I found the crumble was way too buttery, like a paste. Then I realised that some of the 4 tbsp of butter listed as crumble ingredients should probably have gone into the filling instead. Note that the first instruction for the filling is "melt the butter", but no butter is listed in the ingredients for the filling. Can you clarify? Surely only about 2 tbsp of butter should go in the crumble, with the other 2 going into the filling?